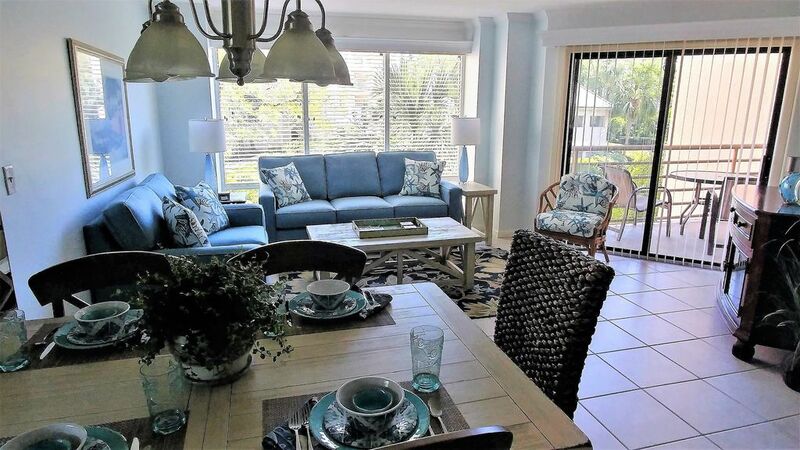 This villa is a beautiful spacious condominium located in prestigious Palmetto Dunes Resort in the oceanfront Villamare complex. Our villa has been renovated with all new carpet, entirely painted and new living room and dining room furniture. The lovely open floor plan of the living area provides plenty of space for enjoying family and friends. Living room includes a flat screen TV and access to the balcony that has a table and 4 chairs for enjoying the gardens and pond. The updated kitchen includes granite counter tops, stainless steel appliances and seating for two at the breakfast bar. The master bedroom has a king-size bed, flat screen TV, private bath and balcony access. The master bedroom bathroom has a stunning brand new double vanity sink with marble counter top. The second bedroom has two queen-size beds and recently remodeled bathroom. Includes a flat screen TV with DVD player and access to a second balcony. No need to pack linens as they are provided. Our unit overlooks the beautiful lagoon and gardens where fish and wildlife can be observed. A walk through the garden leads to the warm, blue ocean and large outdoor pool, kiddie pool and hot tub, a separate area with BBQ grills and sun deck. There is also a indoor pool and health club that provides state of the art equipment that our guests have access to. Palmetto Dunes is a beautiful private, gated community with 3 miles of pristine beach, 3 championship golf courses and 23 tennis courts. As our guests you will enjoy 15% off bike, canoe and kayak rentals at the OUTFITTERS store which is a short walk from the villa. There is also a general store 5 minutes walk away and many dining options within Palmetto Dunes Resort. Beautiful garden's throughout the resort.